Women Leadership Academy in April 2015, one of the women asked through an interpreter, “what do you do when he won’t listen because he has been drinking?” This opened up a conversation that included both giggling and tears as women talked together, through an interpreter, about a taboo topic. 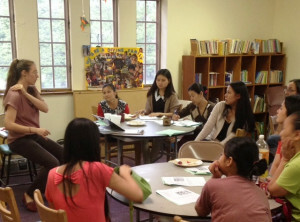 The conversation continued for three sessions of the Refugee Women Leadership Academy and focused on what these women could do for themselves and their children. At the third of these sessions, two OTOC leaders who are also involved in Alanon shared their experience, strength and hope and invited the women to consider developing their own support group in the Karen language. At the same meeting, Pam Franks who is part of the Refugee Health Collaborative, told the women how she is working with clergy from refugee serving churches start a program modeled on Alcoholic Anonymous for refugee men in Karen, Kareni and Nepali. This meeting brought hope to this group of refugee women who will be the core of IPL’s efforts to work with leaders of Omaha Together One Community (OTOC) who are organizing improve behavioral health care and support programs for families in Omaha.